Cheshire’s distinctive vernacular architecture crops up all along the Sandstone Trail. Keep an eye out, in particular, for our distinctive ‘black and white’ half-timbered cottages and solid, sandstone-block built cottages and farms. Some of the older farmhouses have grand Georgian frontages, too, added at a time when Cheshire agriculture was in its prime. 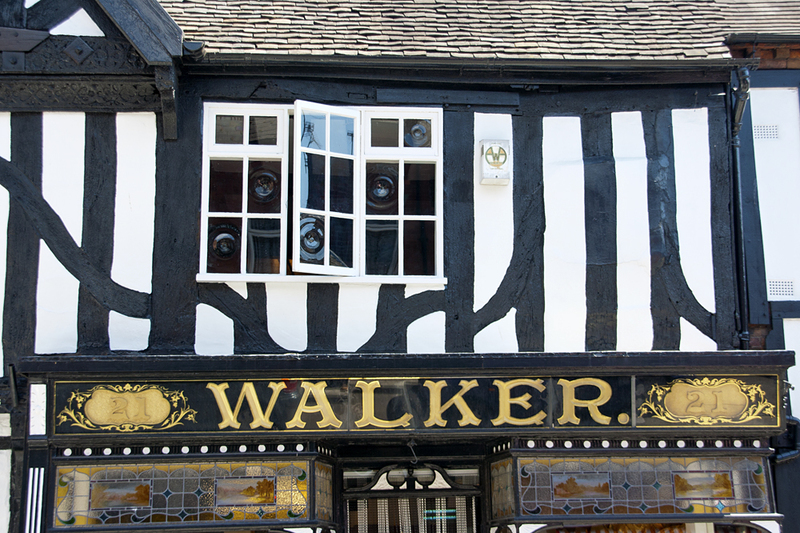 The earliest ‘black and white’ buildings feature curved timber ‘A’ frame, or ‘cruck’, end gables. The whole timber box frame sits on a low sandstone foundation wall to keep it dry above the damp ground. Such houses would originally have been thatched but most now have more recent slate roofs and brick chimneys. Similarly, the original whitewashed ‘wattle and daub’ walls of mixed clay and cow dung plastered over woven hazel have long since been replaced by brick infill, or ‘noggin’. Still others have been wholly plastered over, and little outward trace of their timber frames survives. In most cases, the old wooden mullion windows, too, have been replaced by casements. Each manor had its own manor house or hall. These ‘family seats’ are a defining feature of Cheshire. Usually built outside the villages, the halls were often ‘black-and-white’ timber-framed buildings. Notable examples along the Trail, from north to south, include: Austerson Old Hall, relocated near Alvanley; Utkinton Hall; Hulgrave Hall and Tiverton Hall near Tiverton; Broxton Old Hall below Bickerton; Hampton Old Hall and Tushingham Hall. Manor houses and monastic granges were often protected by a moat, and in many cases the moat is all that remains. Over 200 moated sites are known across Cheshire. One of the largest and best survives at Iddenshall Rough, a few hundred metres west of the Trail, near Tarporley. Another well-preserved possible moat can be seen beside the Trail to the east of Manor House Farm, near Hampton Heath. Outstanding half-timbered houses and pubs on the northern section of the Trail include: the ‘Ring O’ Bells pub at Overton; Austerson Old Hall below Alvanley Cliff; the ‘cruck’ framed old smithy, in Beeston village; Moathouse Farm, on Horsley Lane; and a cottage above Pennsylvania Wood. The much altered Pheasant Inn at Higher Burwardsley still features both original half-timbering and block-built sandstone outbuildings; while a tiny, well-preserved sandstone and ‘cruck’ framed cottage survives below Peckforton Gap. To the south is Manor House Farm, near Hampton; brick infilled Pearl Farm and the wonderful, unspoilt Blue Bell Inn at Tushingham. Equally, notable buildings along the Trail constructed of large, hand cut blocks of sandstone include: The Bear’s Paw, Frodsham; New Pale Lodge, Manley; Eddisbury Lodge, Delamere; Roughlow Farm and Rock Farm, at Willington; Fishersgreen Farm, near Tarporley; Castlegate Farm, Beeston; cottages at Higher Burwardsley; Peckforton Gap Lodge; Chiflik Farm, near Gallantry Bank; and Larkton Hall, south of the Bickerton Hills.